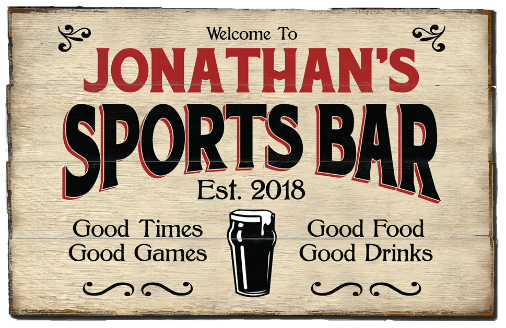 Your favorite sports fan, would appreciate this rustic style large Personalized Sports Bar Planked Wood Sign - Gold Beer Mug in their home bar area, game room, man cave, garage or other favorite space. Comes personalized with your name and a 2nd line of text and can be easily hung. Ideas for a 2nd line of text are established date, city and state, a favorite saying or even a declaration to your favorite team or hobby.